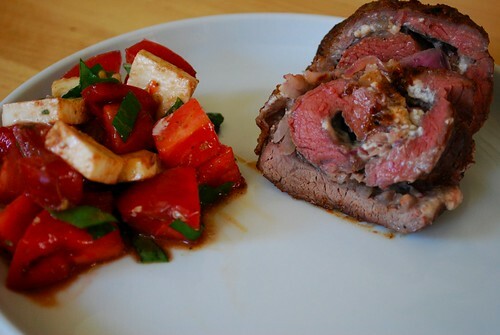 Recipe: Blue Cheese Stuffed Steak and Caprese Salad | Dinner Love. My boyfriend hates steak. He eats meat. He eats ground beef, pork chops, sausage and pretty much any other type of meat known to man, but will not touch steak. I’m not sure why. He probably doesn’t even know why. In any case, I think he’s nuts and anytime I want a steak I have to concoct new and exciting ways to eat it. 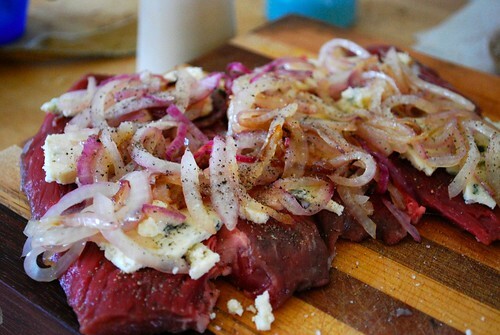 That’s why I decided to take a sirloin steak my mother gave me and fillet it and stuff it with onions and blue cheese. The salad was thrown in as an afterthought for two reasons. One, you can’t have a meal with just meat. It’s just not right. Two, I have a bunch of basil and tomatoes that need eating. I have to warn you that the recipes that follow don’t have any specific measurements. 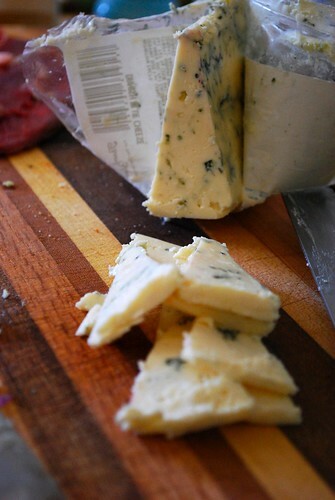 You really don’t need them for this, it’s more of a “stuff steak with as much blue cheese as you like” type of deal. 1 sirloin steak, about 1/2 lb. You can use more if you like. You could also use a meat other than sirloin if you wish. Flank would work well. Red onion, sliced thin. About 1/2 of a small onion, or to taste. Pan that can be used both on the stove top and in the oven. 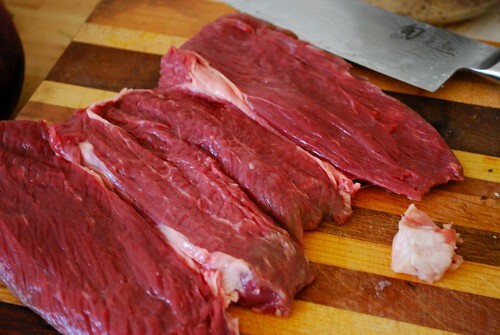 Using a super sharp knife, butterfly the steak by slicing it in half width wise and opening it up. 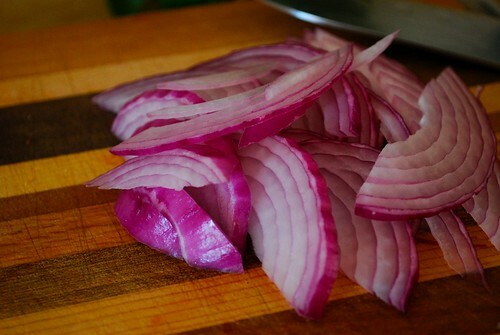 Slice your red onion into very thin slices. Saute the onion with a bit of olive oil for about a minute or two. This will make them sweeter. 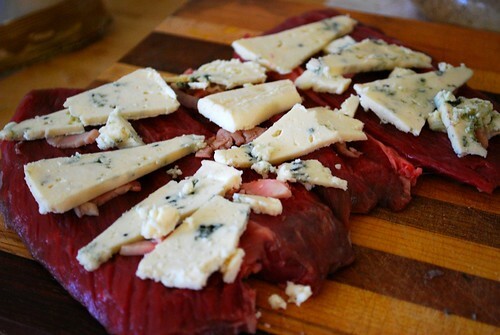 Layer the blue cheese on the steak. Put the sauteed onions on top. 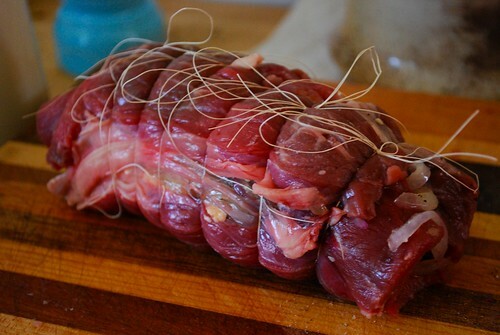 Now roll the steak up, and secure every inch or so with butcher’s twine. Season on all sides with steak seasoning. I always use Old Bay. A note about butcher’s twine-I didn’t have any, so I used sewing thread instead. It worked just fine, but you should probably buy yourself some butcher’s twine anyway. I keep meaning to pick some up, but I always forget. Plus, you really have no idea if your sewing thread with hold in the high heat you will be cooking the steak in. 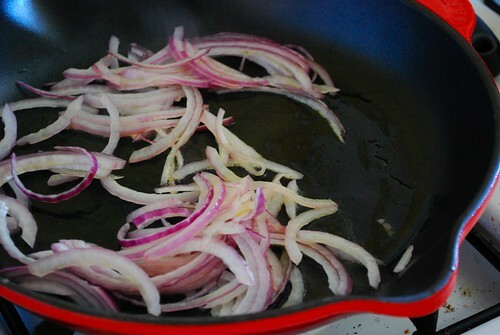 Using the pan that you sauteed the onions in (make sure it is oven-safe!) 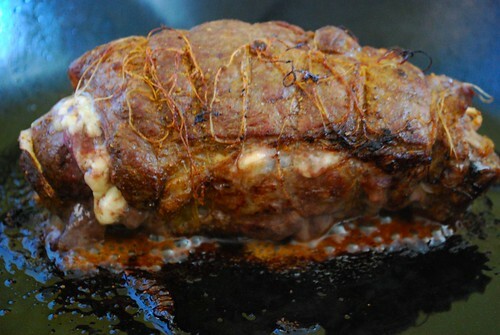 sear the steak roll on all sides so that it has a nice crust. 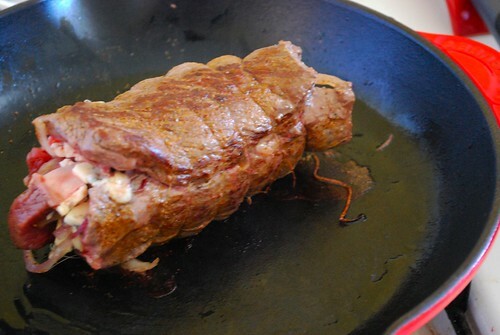 Once it has been seared, put the whole pan in a 400˚ oven for 15 minutes. I like my steak rare to medium rare, so 15 minutes was perfect. Leave it in 5-10 minutes longer if you prefer yours medium to well done. Remove from the oven, and let it sit for at least 10 minutes. This will allow the juices to redistribute. 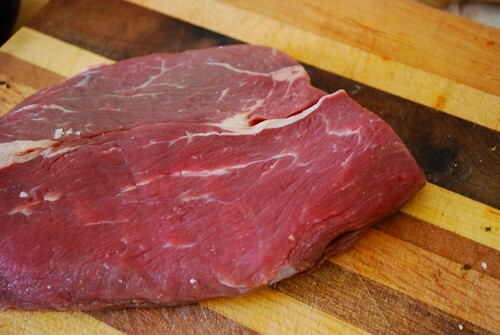 Plus, keep in mind that the steak will continue to cook during this period, raising in temperature up to 10˚. While you wait for the steak, make the salad. 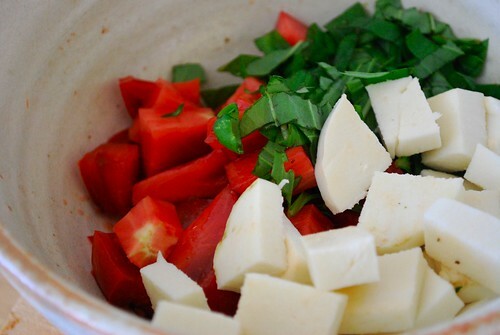 Cut the tomato and the mozzarella into large cubes. 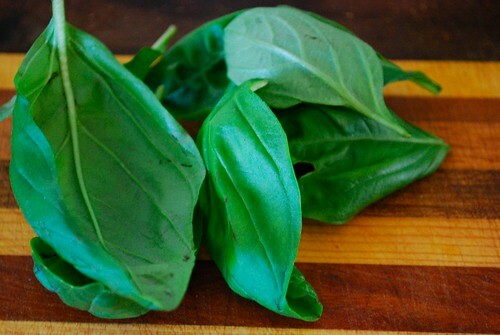 Grab a handful of basil and cut into strips. 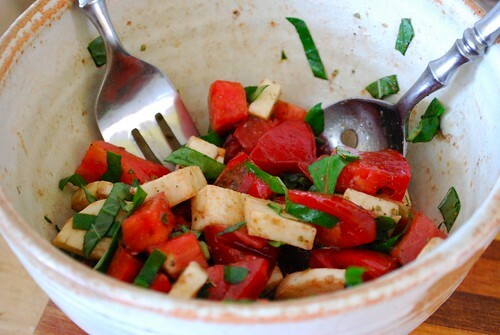 Put all three ingredients into a bowl together. 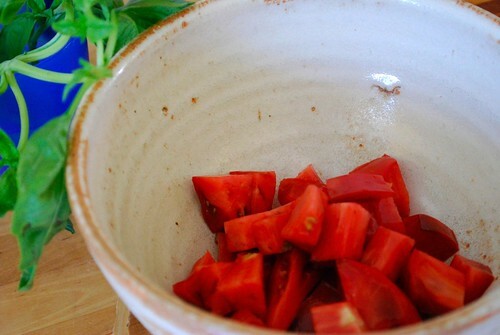 Add the salt and pepper, garlic powder, dried oregano, and a splash of olive oil and a smaller splash of balsamic. Eyeball it. Use less than you think you need at first. You can always add, but removing ingredients is difficult. Just like mascara, or eyeliner. (I apologize to my male audience members, who may or may not have any idea of what I’m talking about!) Mix together. Once the salad is done (and 10 minutes have elapsed) cut the steak into slices. Ok, now, when you eat the steak, but a piece of steak in your mouth, followed immediately by a piece of tomato. ← Today I Am Lazy. When something’s wrong, I want to put a piece of salad on it! steffy are you sure its only 1/2 pound of sirloin or its a pound and half ?? sounds great Im gonna make it tonight ! It was definitely only 1/2 lb. I made this meal for only two people so it was actually plenty of food! Once you butterfly the steak it looks much bigger than it really is. 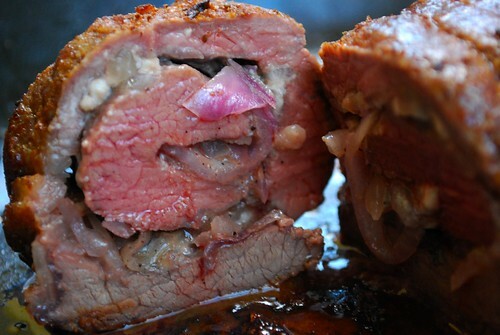 Of course, you could use a bigger piece of sirloin and do the same thing, you would just need more cheese and onion.